The lowest readings for pollutants at the kerbside monitoring station at Putney High Street are encouraging hope that air quality in the area is finally starting to improve. Provisional data suggests that average nitrogen dioxide (NO2) levels on Putney High Street are lower than they have been since recording started in 2009 although they remain substantially above EU limits. The average concentration of nitrogen dioxide recorded between September 2012 and August 2013 was 11.8 per cent lower than the preceding 12 months. Compared to September 2010 to August 2011 the average nitrogen dioxide level was 17.6 per cent lower. Over the last 12 months the older, more polluting diesel buses which run via Putney High Street have been gradually replaced with new, cleaner models or fitted with pollution reducing catalytic-convertors. 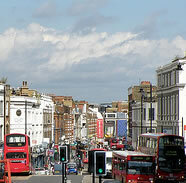 This new investment came about after Wandsworth Council used number plate recognition cameras and real time air quality data to pin-point buses as the main source of pollution on the high street. In partnership with the Putney Society, the council used its findings to secure rapid improvements to Putney’s bus fleet from the Mayor of London. Because the bus improvements were made gradually over the last 12 months the full impact will not yet be reflected in the year on year comparisons. Detailed analysis is now underway to ratify the raw data and identify any other factors, like weather or road closures, which could account for the potential fall in nitrogen dioxide. “The raw data looks promising and our hope is that the cleaner bus campaign is behind a genuine and sustainable fall in nitrogen dioxide levels. However we can't afford to be complacent and there is a long way to go." The Council will be publishing a full air quality report later this year which will reveal more about the impact of the bus improvements and how other vehicle types are contributing to nitrogen dioxide concentrations.